What makes a city? What makes architecture? And, what is to be included in the discussions of architecture and the city? Attempting to answer such ambitious questions, this book starts from a city’s specificity and complexity. In response to recent debates in architectural theory around the agency and locus of critical action, this book tests the potential of criticality through-practice. Rather than through conceptual and ideological categorisations, it studies how architecture and criticality work within specific circumstances. Brussels, a complex city with a turbulent architectural and urban past, forms a compelling case for examining the tensions between urban politics, architectural imaginations, society’s needs and desires, and the city’s history and fabric. Inspired by pragmatist-relational philosophies, this book tests the potential of criticality through-practice. It studies a series of critical actions and tools, which occurred in Brussels’ architectural and urban culture after 1968. Weaved together, Brussels architectural production emerges from a variety of actors, including architects, urban policy makers, activists, social workers, and citizens, but also architectural movements and ideologies, urban renewal programs, urban traumas, plans and projects, and mundane everyday practices and constructions. 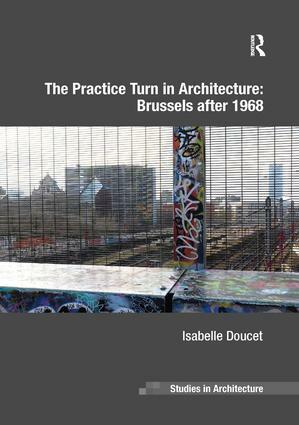 This book contributes to the study of Brussels and offers a timely contribution to recent scholarship on the critical reappraisal of architectural debates from the 1960s through to the 1990s. In addition, by showing how pragmatist-relational philosophies can be made relevant for architectural theory, the book opens hopeful potentials for how architectural theory can better contribute to the formulation of a critical agenda for architecture. Isabelle Doucet is a lecturer at the University of Manchester, Manchester Architecture Research Centre. She is the co-editor of Transdisciplinary Knowledge Production in Architecture and Urbanism (Springer, 2011).